Installation information with graphics for English/French Technical translation shareware, ASCII Glossaries and Databases, and User Database Manager for Windows 95, 98, 2000 and NT 4.0. Maintain your data with simplicity and complete freedom. If you find a bug please report it in order for improvement. After downloading the files DSCANV5.EXE and Nucleus.zip on your computer, the installation takes less than 10 minutes. Print or save this page for future reference. Informations en français sur l'installation conviviale et l'enregistrement de DSCAN. Select Save this program to disk. Choose a folder of your choice on your computer. Remember where you saved the files DSCANV5.EXE. Same process for Nucleus.zip (and/or UDB.ZIP, and/or TEXT.ZIP). They will be downloaded in the download directory defined in your web browser. Select another directory of your choice or accept the one defined in your web browser. But in any case you must remember where you saved the downloaded files. Press Save. In the following procedure, it is assumed that the root directory resides on the c drive. If you are using another drive, substitute that name for c. For example, if you are using the d drive, type d:\dscan. 1) Once the self-extractable file DSCANV5.EXE is saved on your machine, open the file manager and double click on DSCANV5.EXE to unzip the files from DSCANV5.EXE into the default directory. When the Winzip-Self-Extractor dialog box appears, you can accept or change the indicated default path then select the button Unzip. Follow the prompts... The installation will guide you through the setup of DSCAN-UDM, and will create the Start > Programs > DSCAN-UDM main menu options. Note: Users must have administrator privileges to complete the installation. Note: Close DSCAN. You are now ready to install the Nucleus Database System. 4) Once the self-extractable file NUCLEUS.ZIP is saved on your machine, copy it in the Dscan\Bin sub-directory created during the previous step (step 3). The file nucleus.zip contains 53 files composing the English/French technical database. It is advised to place all zip files downloaded from this site into the Dscan\Bin sub-directory for future uses. This a view of the Dscan\Bin sub-directory with all the necessary zip files. A DOS window will open the file Nucleus.zip located in Program Files\Dscan\Bin to extract the 53 files existing in nucleus.zip into the directory Program Files\Dscan\Nucleus. 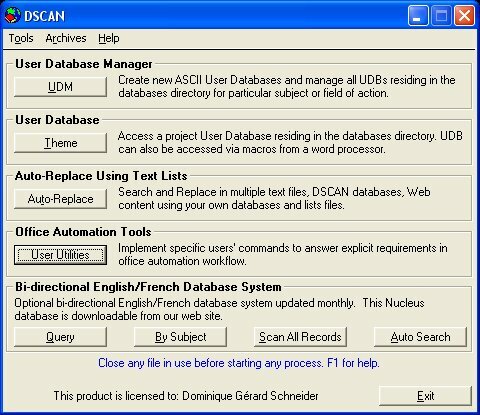 After the 53 files are extracted into the Dscan\Nucleus sub-directory (it will take a few seconds), you are now ready to use DSCAN-UDM and its English / French technical database. The DSCAN-UDM 32bit installation is done. NOTE: DSCAN accepts all accented characters. If you have problems typing accented characters on your system such as è é or à select My Computer Control Panel - Keyboard - Language Properties - United States-International. This setting will allow you to type accented characters without re-mapping your keyboard. You may need to install the file Kbdusx.kbd in the windows\system directory of the machine in question. You can also select one of the French keyboards, but I personally do not advise it for most English speaking users. When payment is received we will send you the latest Nucleus Database System and a license file for DSCAN-User Database Manager. The license file may not be provided or otherwise made available without proper authorization. For more information on the registration's process, read the readme file located in the DSCAN home directory after its installation or contact ContactEZ.net Independent software developer. We do not currently offer any written documentation, the on-line help is very complete. When payment is received we will send you the latest Nucleus Database System and a license file for DSCAN-User Database Manager. This license file will unlock the software as applicable by the software license agreement. The license file may not be provided or otherwise made available without proper authorization. For more information on the registration's process, read the DSCAN help file located in the DSCAN home directory after its installation. DSCAN-UDM, DSutil, and any accompanying modules are protected by copyright laws and remain the property of Dominique G. Schneider. Dominique G. Schneider grants to evaluators a non-transferable right to use the shareware version of the software for a limited time for the sole purpose of evaluation, subject to all the terms and conditions of this Agreement. The Software is designed to operate with an authorized key supplied by Dominique G. Schneider or its authorized representatives. Evaluators may not decompile, disassemble or otherwise reverse engineer the Software.